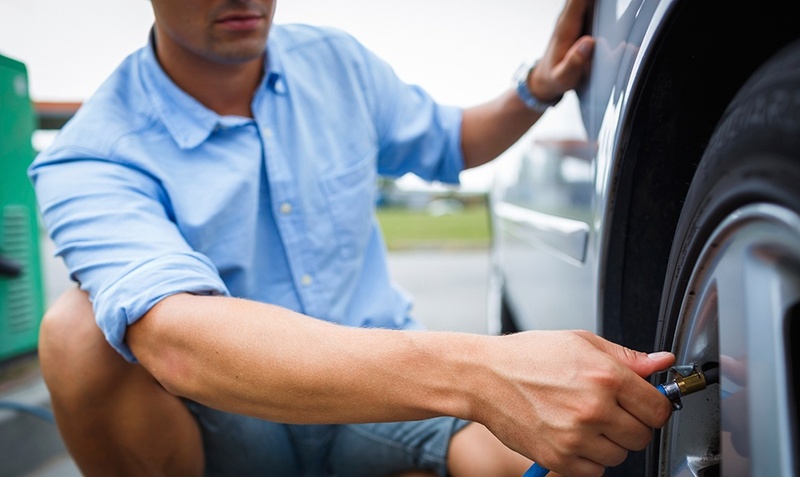 When taking your vehicle for a regular inspection with a certified technician or tire specialist, you may notice some retailers promoting inflating tires with nitrogen. How will nitrogen impact your driving experience? Nitrogen gas is naturally occurring, non-flammable and can be used for tire inflation without negative environmental impacts. It accounts for 78% of the air we breathe, while oxygen, other gases and moisture make up the remaining 22%. But why inflate your tires with nitrogen? Over time, fresh air will slowly seep through the tread and sidewall of a tire, resulting in a loss of pressure. The gradual decrease in tire pressure with air-filled tires (approximately 1 to 2 psi per month) is reduced when tires are inflated with nitrogen. This is because oxygen molecules are smaller than nitrogen molecules. This means your tires will maintain the required tire pressure a little longer, but it’s still important to maintain monthly tire pressure checks. Nitrogen inflation also reduces the amount of moisture, in the form of water vapour, in a tire. The presence of moisture is the main reason tire inflation pressure varies with temperature, as the air in a tire heats or cools. This variation can be less for nitrogen-inflated tires. NASCAR – NASCAR teams use nitrogen because it allows them to predict tire pressure fluctuation. Nitrogen fluctuates with temperature change, but it does so less than when water vapour is present. In addition, higher nitrogen levels eliminate the explosive properties of oxygen. Commercial Airlines – The United States Federal Aviation Administration requires nitrogen in aircraft tires because it reduces the potential for water vapour freezing at high altitudes. In addition, airlines such as Boeing use nitrogen membranes or “OBIGGS” (on-board inert gas generation systems) to layer fuel tanks with inert nitrogen. Again, this reduces the potential for explosions. Government Agencies – NASA, the Canadian Armed Forces and the U.S. military use nitrogen for many of the same reasons it’s used in commercial aircraft. Inflating your tires with nitrogen won’t be harmful. In fact, there are some benefits. As always, consumers interested in nitrogen inflation should consult with a tire specialist or technician to learn more. Whether your tires are inflated with air or nitrogen, it’s important to manually check your tire pressure once a month. Drivers will benefit from increased safety, handling and braking performance, longer tread life, better fuel efficiency and reduced greenhouse gas emissions.